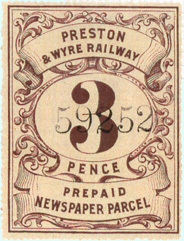 We will deal briefly with the history of railway newspaper stamps, but the primary purpose of this page is to show you what a wide variety of Newspaper Stamps were issued by the railways. The 1712 Stamp Act placed a tax on each and every newspaper, but also conferred free transportation on newspapers. This Act was repealed in 1855, and with it went the newspapers’ right to free transportation. At that time, the Post Office had a monopoly over the delivery of letters. However, it did not have a monopoly over the delivery of parcels – indeed, it did not even have Parcel Delivery service. 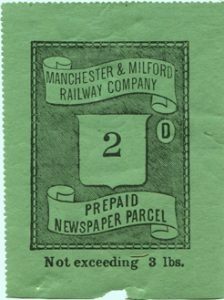 The railways of the day saw this as a good commercial opportunity, and many of them set up their own newspaper parcel delivery services. 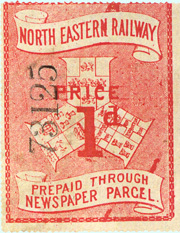 As there was no Post Office control over such services, the newspaper stamps produced by the railway companies appeared in a myriad of different designs. 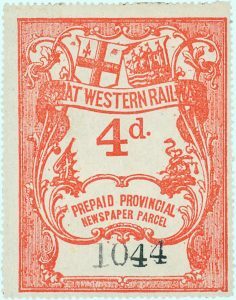 Just scroll down and feast your eyes on a sample of the wonderful railway stamps issued by the independent railways in the period from 1855 until the Grouping of the Railways in 1923! 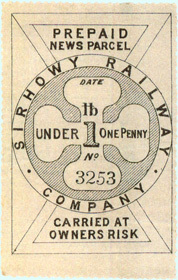 In the period 1855 to 1922 there were over 100 independent railway companies in Britain and Ireland. It was not uncommon for rival companies to have competing lines running next to each other over key routes – good for competition, but wasteful! 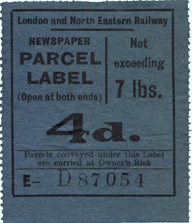 Most railway companies issued newspaper stamps valued at 1d, 2d, 3d, 4d and 6d, with parcels of newspapers being charged on the weight of the parcel. 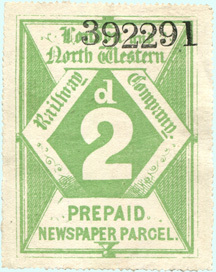 Many companies also issued ½d stamps for the carriage of single newspapers. 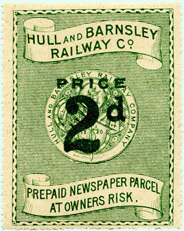 Some companies also issued stamps with a face value in pounds weight (e.g. 1½ lb, 3 lb, 6 lb, 12 lb, 24 lb, and even 48 lb). 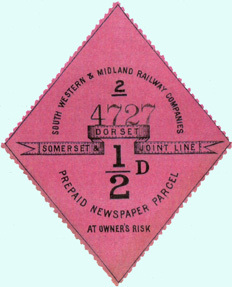 Most (but not all) railway companies printed a serial number (usually referred to as a control number) on each stamp, as a precaution against fraudulent re-use of stamps. 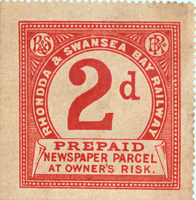 If you examine the above examples you will see that stamps of the Pembroke & Tenby Railway, the Taff Vale Railway, the Midland & Great Northern Railway – and some others – have no control numbers printed on them. However, all of the bigger companies used control numbers. 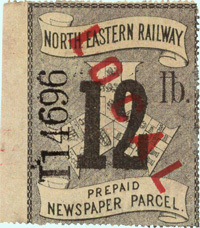 Some of the earlier railway newspaper stamps were quite large, as you can see from the following examples. 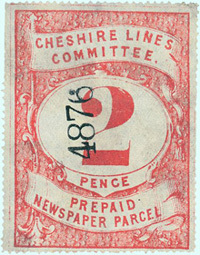 The LOCAL overprint (below right) means that this stamp was to be used for parcels of newspapers carried only within the lines of the company (but not on the lines of ‘foreign’ companies). After the tribulations of the first World War, and following on from years of neglect and under investment, the railways were in a pretty poor state by 1920. 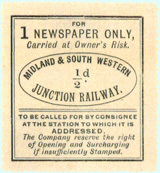 The government of the day decided that radical change was need and passed an Act of Parliament which caused all (well, nearly all) of the independent railways to be merged into four huge companies … the so-called ‘Big Four’, the London Midland & Scottish Railway (LMS), the London & North Eastern Railway (LNER), the Southern Railway (SR), and the Great Western Railway (GWR). At first, these four new companies did not have any stamps printed with the new company names. 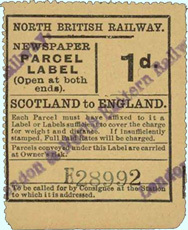 As a stop gap (until they got definitive issues printed), they issued provisional stamps. There are two kinds of provisionals: overprints (overprinted with the new company name on existing sheets of predecessor company stamps), and clones (sheets of newly printed stamps based on former company designs, but with the new company name printed instead). We have very few examples of LMS newspaper stamps. 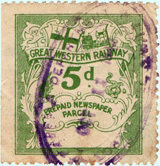 It is possible that LMS general parcel stamps were also used as newspaper stamps. 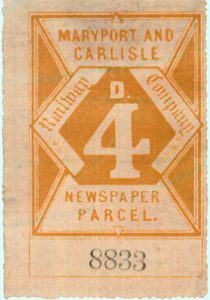 If you have more information about LMS newspaper stamps we would be glad to hear from you about them – see the Contact Us page. 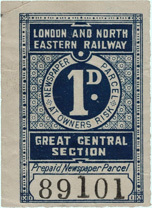 On the other hand, there are lots of different LNER newspaper stamps. Here are some examples of provisional overprints on left-over stock of former company stamps. 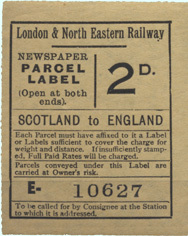 There are also examples of newly-printed LNER provisional clones – based on former company designs, but with London & North Eastern or LNER printed on them. 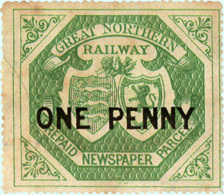 The North British Railway (NBR) style stamps above left and below left show the same NBR design being used to create provisional overprints (above left) and subsequently to create cloned provisionals with the company name changed (below left). 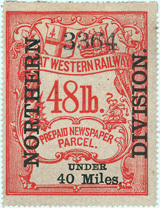 Curiously, the LNER did not go on to create its own design of newspaper stamps, opting instead to use the NER (as in the red 3d stamps above) as the basis for all its definitive newspaper stamps. 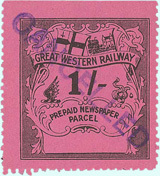 As well as several red sets, they also issued a set printed in blue ink and a set in black. After the hardships of another World War, and following on from even more years of neglect and under investment, the railways were in a very sad state by 1948. The government of the day this time decided that even more drastic action was needed. The ‘Big Four’, along with all major road transport concerns plus the docks, canals and ports etc., were all nationalised. We don’t need to concern ourselves too much here with the mechanics of Nationalisation. All we really need to know is that rail transport became the sole responsibility of British Railways (albeit under several different names from time to time). BR issued two sets of provisional clones, both based loosely on the same former LNER design. The Western Region design (far left) is fair enough … but the so-called EASTERN / NTH EASTERN SCOTTISH (L.N.E.) REGION (immediate left) never existed. Nevertheless, these stamps were issued and used !